Although Friday night I did my knee in doing drunken Yoga. At my age I would have thought I know better. Oh 'eck! Join the club. Hope it's better for Nottingham, otherwise you might end up borrowing my walking stick! As for City, yep, the boys in blue are doing you proud. Been really impressed with them so far - much better than our lot at the moment. The knees are a bit stiff but otherwise fine. No sudden movements though. I guess your not too happy with Derby. I hope Big Sam doesn't go all defence minded like he did at Bolton. Bad news, Wayne. I'm not going to be able to make Fcon after all. It's the same old problem - arthritis in the spine - and it went into flare up mode a couple of days ago. I was hoping it would be gone in a day or so, but that's turned out to be wishful thinking. Unfortunately, there's no way I could make it to Nottingham in this condition, not without spending the weekend up in my room, flat on my back. I've tried cancelling my hotel reservation directly, but apparently only Fcon organisers can do this. Thus, I've emailed Pat at isisdirect@aol.com. Hopefully, she'll be able to contact the hotel and cancel the reservation for me. So I've blown it, Wayne. And I was looking forward so much to seeing you, Steve Upham, Chris T, and the rest of the gang. Perhaps next year, eh? Get yourself fit and well, Dave - just reading "arthritus of the spine" gives me the willies. There are lots of folk worse off than me, but I appreciate your concern. Ok, I haven't been here for 3 years so I thought I'd say hello again. Not been on here for a while so I missed your message Dave. I tryed to find you at the Con. hopefully next year. Hope you get restbite from the back, nasty stuff. Well at least your upto fifth after turning over West Ham, I guess won't mention Arsenal and the cup. Us 3-3 draw, a downside of the con, I couldn't find out the score until Sunday. Oh dear. Well at least we squeezed into the next round of The Carling Cup. Nice to see you again Chris T. I bought one of your spendid books, Tourniquet Heart and forget to get it signed, ho hum. No, I haven't seen that...I'll Google it! 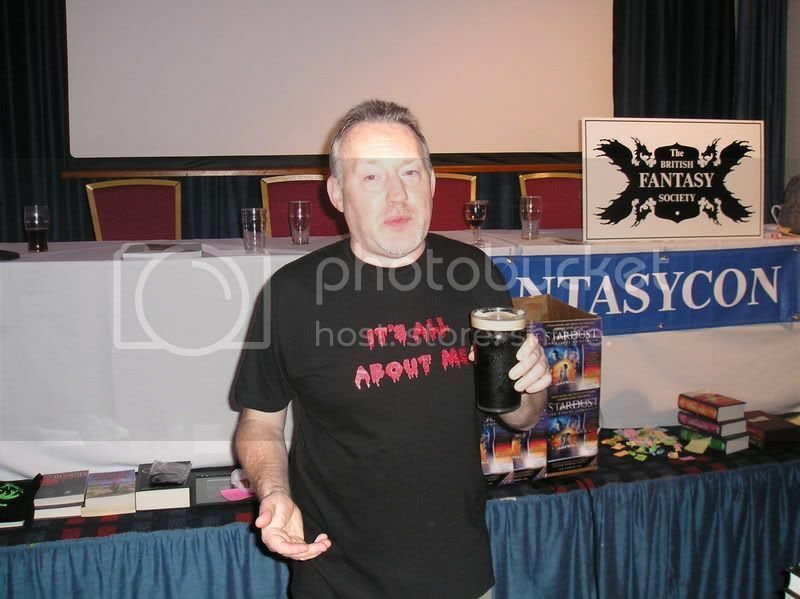 Wayne - yes, I'd been looking forward to catching up with you and the others at FCon. Never mind, if this year is anything to go by, next year will be here before we know it. The sky blues are still looking good, aren't they? Let's hope they keep it up. As for the Toon, we're doing okay, but still not firing on all cylinders - despite the heady heights of fifth. And, yeah, let's not mention Arsenal. Oh, and welcome back Eddy! Sorry about the win Dave, crikey what are your pitches made of up there, concrete? I think it's the only answer to all your injuries. 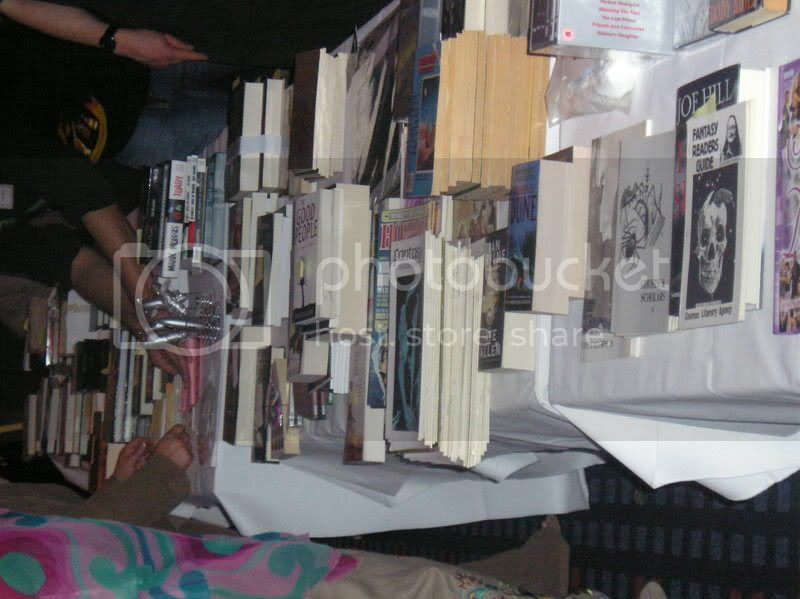 As for FantasyCon here are some pics from the raffle. i wonder if these work. Steve 'It's all about me' Jones. Michael 'It's all about him' Marshall (sometimes) Smith. and here's what you could have won. Actually our genial hosts 9and two of the guests of honour.) were a fine double act. I've just started reading Darker Than you Think by Jack Williamson and It's a corking tale. Starta a bit noirish in the way it's written, but soon gets in it's stride and ratchets up the tension. PS Crikey those pictures are small, anyone know how to make them bigger??? No need to apologise, Wayne. The better team won by the proverbial mile. As for the pitches being made of concrete, we don't get much rain over here so you could be right. I guess it's a good time to be a City fan right now. Enjoy!!!! Well we don't have that problen in Manchester. Another good win against borror and I see Owen got you a winner against the Toffee men. Well happy with ol' blue eyes, that's Sven to you lot. Very true, Wayne. Though Manchester makes up for the rain in many other ways. It really is a fab place. My second favourite city! As for Sven, he's certainly got you firing on all cylinders - with more than a little help from Elano, of course. At the moment I'm off line will be for a month by the look of it, I'm at my little sister's at the moment. I recently moved so of course the telephone line was knackered. Ho Hum. Have a good holiday everyone, if your not getting time of I hope you get paid extra big wodges of cash.